Vancouver Canucks president Trevor Linden certainly isn’t wrong: it is a big world out there. There are an estimated 7,324,782,225 people alive right now, and that number is expected to grow a little more every year. This is part of a radio interview that Linden gave to TSN 1040 this week. He was discussing players who come to organizations with somewhat checkered pasts, for lack of a better way to phrase it. Sure, he’s right about the first part. It’s a very big world, full of challenges. Taxes, vices, people out to hurt you; there are plenty of challenges that humans face every day. Where Linden may not be on the right track, though, is the second half of his statement – particularly if it applies, although he refused to confirm this, to current Buffalo Sabres left winger Evander Kane. Kane sits on a laundry list of transgressions in his still fairly-young pro hockey career. They start with mild, subjective problems. Posting a picture of a ‘money phone’, made out of a stack of what looked like either $20 or $100 bills, being used to make a ‘call’ from a balcony in Las Vegas, for example. Not a crime, just in poor taste while the NHLPA was mired in a lockout preventing thousands from having jobs around the NHL (including everyone from concession stand workers for games to parking lot attendants). Then, there was the money push-up picture a few years later, where Kane – once again in Las Vegas – Instagrammed himself doing push-ups with more stacks of money on his back in Sin City. Also not a crime; this time, it was almost amusing. Just, once again, maybe in poor taste. Kane was scratched by the Winnipeg Jets in the winter of 2015 for apparently refusing to report to a game in his hometown of Vancouver. That refusal to report, as it came out later, was his response to having his clothing thrown in the team’s showers by then-teammate Dustin Byfuglien. The reasoning? Kane had been wearing a track suit to the team’s meeting that morning, instead of the business suit he and his teammates were expected to wear. He was dealt not long after that to the Buffalo Sabres, where he was given a fresh start. At this point, his transgressions moved from being simple PR pains to actual legal concerns. First, there was an accusation of sexual assault. Although ultimately cleared due to insufficient evidence to prove any wrongdoing, it was hard to ignore that Kane was being accused of turning consensual interactions into non-consensual attacks. The above police report (a screenshot from documents acquired by WKBW TV, Buffalo) is one of four counts that Kane is being charged with, in addition to one count of trespassing. Here is where it becomes a problem that there is any possibility that Trevor Linden is referring to Evander Kane when he talks about a ‘big world’ rife with mistakes for young men to make. Kane’s earlier transgressions – the money phone, the tracksuit situation – are what I consider mistakes. Acting in poor taste in a career that’s largely PR-driven? That’s a mistake. Grabbing a woman’s neck, pulling her hair, and seemingly making a habit of doing so? That’s not a mistake, borne of the pressures a big world has to offer. That’s a conscious choice. Don’t undermine that. Of course, I don’t believe that people can’t change. We don’t know if Evander Kane is willing to take steps to improve his behaviour, particularly towards women – and without knowing if he’s willing to try, it would be wrong to suggest he doesn’t deserve a second chance in the future. I think he’s an extremely talented player, and with the help he needs to learn how to respect others, he could be an asset to an NHL club. For every transgression listed above, there are a handful of events Kane has participated in to make his community a better place. He’s brought children from the Boys and Girls Club in Buffalo shopping at Target, dropping $10,000 on gifts and treating the kids to a nice dinner. He’s volunteered at street hockey clinics and visited children in hospitals. He has the opportunity to be a positive asset for whatever city he plays in, and he’s proven it time and time again. The very act of calling his negative acts ‘mistakes’, though, implies that they were accidents. It implies that he holds no responsibility over them – that somehow, it is the fault of the big world he lives in that he assaulted another human being. It suggests that, while his numerous generous acts were active decisions he chose to make, the negative behaviours he has displayed are somehow not his fault. He gets full credit for doing good, but is given excuses for doing wrong. 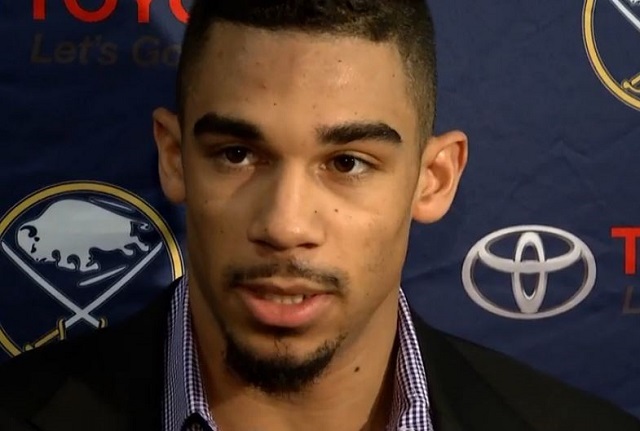 Evander Kane deserves the chance to change, but he doesn’t deserve those excuses. Physical violence does not deserve excuses. It deserves second chances, but it doesn’t deserve shifted blame. Tim Baffoe brought this up earlier this week, talking about MLB closer Aroldis Chapman and his own use of the word “mistake” to describe threatening his girlfriend with a gun. Like with Chapman, Linden continues to let the problem of violence against women fester by using that word – and while it’s not worth tossing away a person as unredeemable for making a bad choice, it *is* worth referring to it as just that. It’s a choice. It’s not an accident – and it’s especially worth remembering that.